Would love to trade if we get some additional honey in the fall. This batch is just about tapped after my herf and hooking up neighbors, family, co-workers, etc. 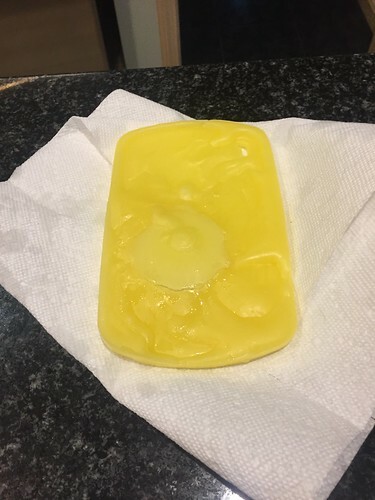 Mickey Moused a solar wax melter using an old cooler. Cut out the top of the lid and replaced it with plexiglass and fashioned an angled stand inside the cooler from some scrap wood. 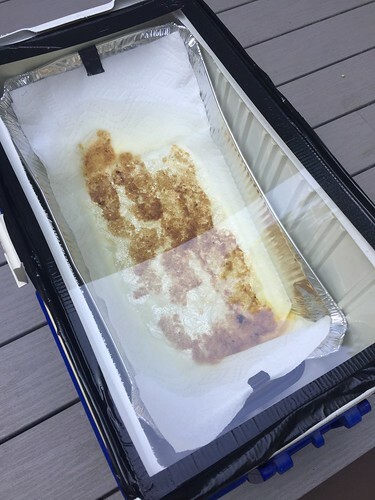 Banged some holes into one end of a foil pan, lined it with paper towels to stop any bee bits and junk from sullying the fresh wax & put a small Tupperware bowl beneath it to collect the melted wax. Now to let the sun do it's thing. Unknown if this is going to work, but the internet says it should, so here's hoping. 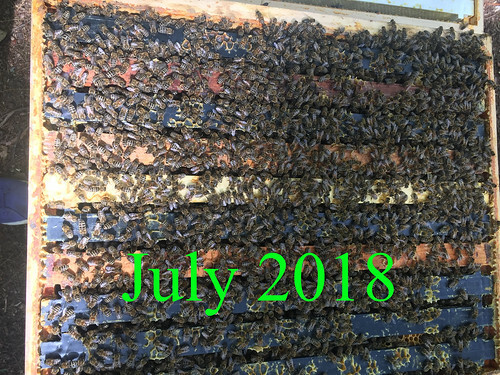 Was going through our hive photos from last year, and came across some pretty convincing visual evidence that this year's hive is significantly stronger than last. That's amazing Vin. Thanks for sharing,. Oh, and thanks for the honey. Yum. 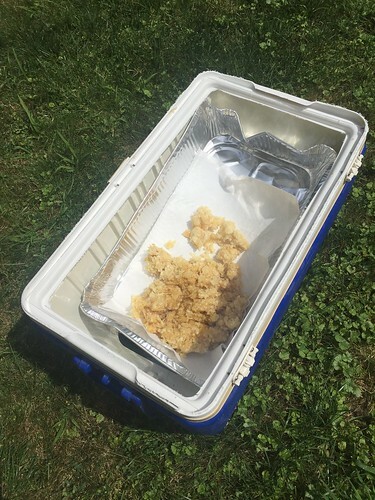 Mickey Moused a solar wax melter using an old cooler. Did it work, Vin? Inquiring minds and all that. btw, if you grow lavender or something similar, you can make your own scents and put them into a candle, if you decide to make some. I don't know how, but there are plenty of places around here that do it as lavender is a fairly large crop here. Kinda' but not really due to operator error. Longer explanation coming when I have more time to self-flagellate. Soooooooo my first foray into melting bees wax produced unexpected results. I ended up rendering another pound or so of honey from the wax cappings, but the wax didn't really melt -- it just kind of stayed in semi-soupy form in the melter. Did some research and found you get much better results if you drain the remaining honey from the wax then rinse the honey comb in cool water to further remove any sweet, sticky stuff. I bundled up the cappings in cheese cloth and pressed it over a metal strain to squeeze out the last bits of honey then rinsed it as instructed in some cool water. I was left with some slightly sticky wax globs that I broke apart and put back in the solar melter to see if a second go at it would produce better results. It was warm, but overcast yesterday -- not much in the way melting took place, and I was a little discouraged. All the wax had melted leaving behind the impurities on the paper towel filter. There's not a lot, but I didn't expect a lot -- maybe enough for one candle? Not worried - hoping to get a bit more this fall. Bottom line though, the solar melter works if you prep the wax carefully! Cool stuff, Vin, it gets better and better. Great looking beeswax Vin. That's exactly what it's supposed to look like, lemon-ish colored. It can vary widely but they have shows/contests for this stuff and that's the color the pros aim for. Well done. Got a chance to do a hive inspection on Saturday. Not a lot is happening in the honey supers. That's to be expected as the spring flowers are done blooming in this area. The one area where I see a lot of bees is in our Rose of Sharon bush which started blooming in mid July and continues to flower now - though I think that's starting to ebb. Didn't take any photos during the hive inspection because the girls seemed a little agitated. In pulling some of the frames, I did see a decent amount of brood in various stages from egg to larva to capped brood, so I know the queen is doing her thing. Also managed to see the queen scurrying around one of the frames. Always reassuring to me when I can find her among tens of thousands of other bees in the hive. Looking forward to the fall honey flow in a few weeks. We get a lot of bees still around on Lavender & Basil patches. There are always several bees in them. Never seen them without bees actually. As the temps have started to get cooler in New England, Grace & I decided to harvest the fall honey this week. Unfortunately, there just wasn't all that much of it vs. what we got in the spring. 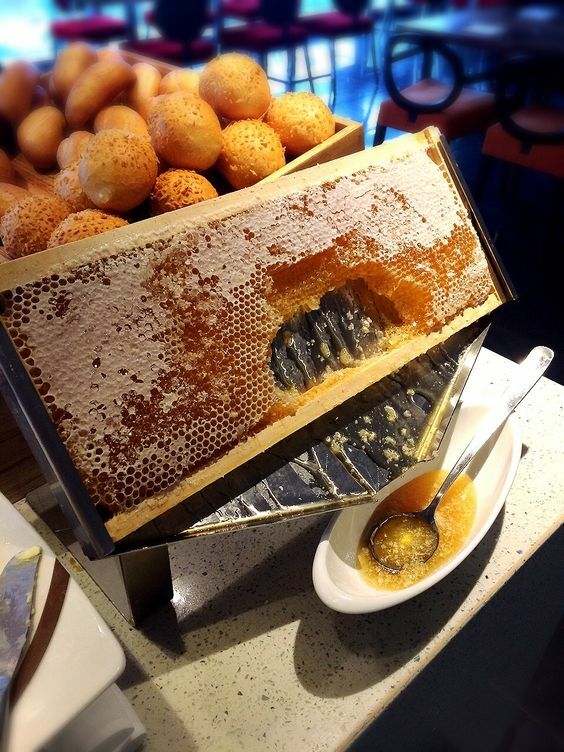 Earlier this year we were able to take out about 30 lbs of honey. 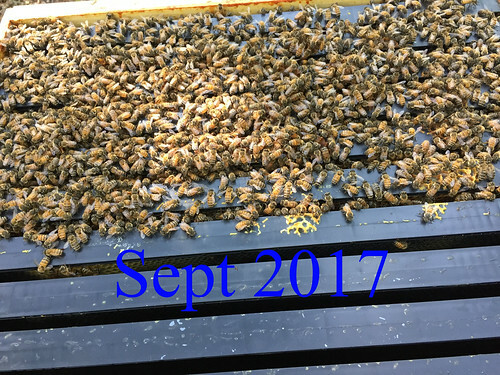 I was expecting A LOT more in the fall based on what I had been told by other beekeepers -- some of whom say their fall yield is 75%+ of the total year's volume. So I was expecting to blow past the 30 lbs we had taken this spring. It was pretty clear we weren't going to get a whole lot because a couple of the frames looked like this - just a smattering of cells being filled. In the end, we got about 12 pounds of a deep amber honey. 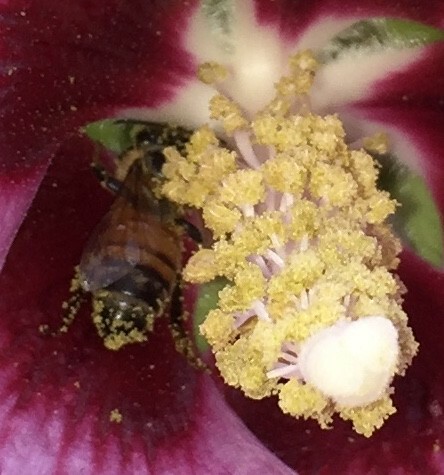 Honey's color depends on what flowers are blooming while the bees forage. The bright gold honey you see in stores -- often labeled Clover Honey - is almost certainly produced in the spring and early summer when clover abounds. Darker honeys, at least in this area, are a result of late summer blooms of flowers and trees. 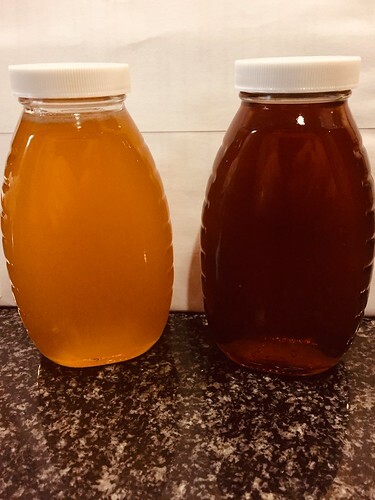 Here's a side-by-side look at our spring honey and our fall honey. The lighter spring honey has a more floral taste to it while the fall honey has a caramely, brown-sugar quality. I've read that the darker honeys are more nutritious. Both are freaking delicious. Going to throw some honey into the next troop auction if anyone's interested. Grace and I have had such a good time with the bees this year, that we're going to add a second hive next spring. Fingers crossed that our current hive over-winters successfully. Otherwise, I may just have a whole bunch of firewood when the snow melts next year. Me too! I'd love to the dark honey. Actually thought this was very cool, saw it a lot in Europe on the breakfast buffets, that's if they are regular wax and not pre-made which it looks like they are, but this is still cool damn it! We’ve thought about trying out foundationless frames in the future. 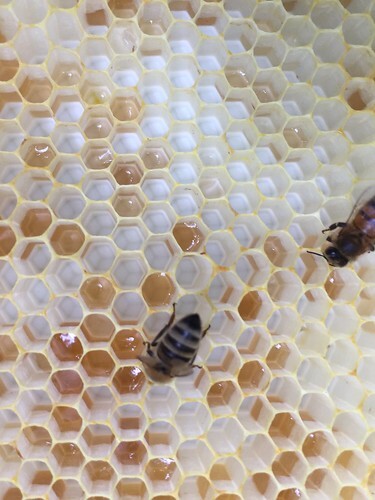 It’s awesome to be able to cut chunks of comb with honey right from the frame. The downside for me is that the bees then need to completely re-create the comb instead of just focusing on honey production. Also, the guy who does our extractions charges more if we use foundationless frames because it apparently takes longer and makes a mess of things. For now, we are going to continue to go with the pre-printed plastic frames, but I’d love to try the foundationless frames once I have some more experience under my belt.